Bust a move, or just busted moves? Following a relatively successful launch on the Wii and a watered-down attempt on the PlayStation 2, it comes as little surprise that a Nintendo DS version of Boogie is available just weeks before Christmas. 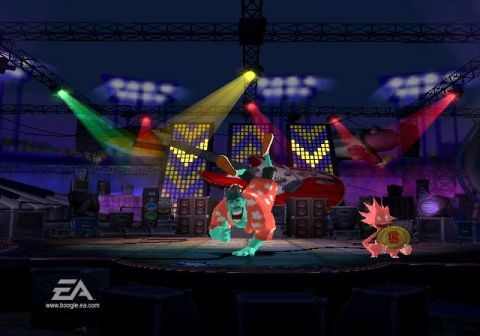 What is surprising is how much the game feels like its song-and-dance console brethren, with covers of familiar pop songs, freeform toe-tapping and colorful original characters. Except the karaoke is missing and the touch screen dancing is slightly gimped. But at least it's still vibrant. Dancing comes in three forms in Boogie (freestyle, copycat, and choreography), but whether guided or allowed to groove freely, the gameplay is essentially the same - swipe and tap the stylus in time with the beat to lean and/or rock wit' it. The Nintendo DS version picks up a decent story-based career mode that adds dialogue bubbles and unlockable items to the mix, with a slightly different progression for each of the five playable characters. Description EA combines dancing and karaoke in this Wii exclusive.